It alerts you to stoplights and traffic cameras, and you can even talk to it. 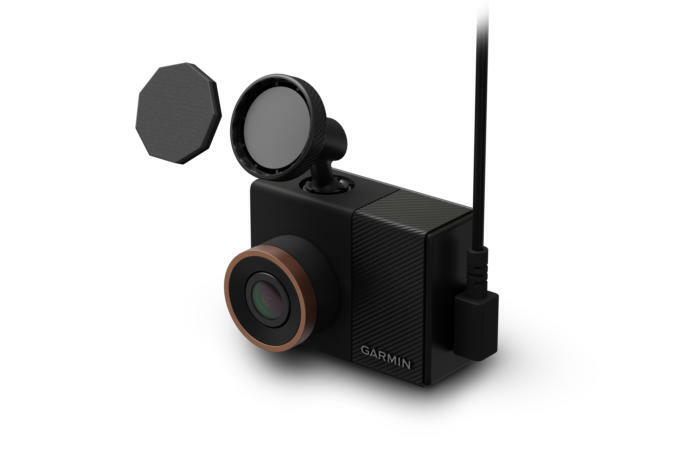 Garmin's Dash Cam 55 adds an essential feature to the dash cam category. These little windshield-mounted watchers are already handy for protecting you from litigious pedestrians and drivers, or capturing a drive-by shooting or strange natural event. The Dash Cam 55 can also keep you from angering everyone stopped behind you at the red light. 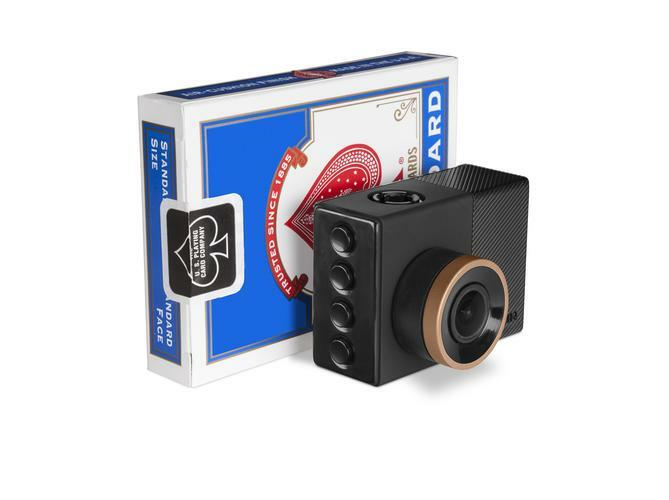 The Dash Cam 55 senses when the car stopped in front of you at a light or stop sign has moved and lets you know about it. Universally applied, this could mean less noise pollution (cars behind you honking), less road rage, and less stupidity. 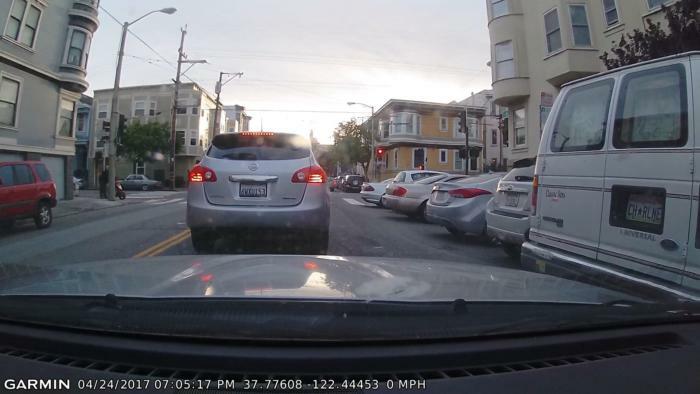 In San Francisco recently, I saw a driver ignore three green lights in a row. Not one of the maybe 15 cars waiting behind ever honked. Go figure. While the wake-up-dummy alert is a boon to humankind, it shouldn't obscure the fact that the Dash Cam 55 is also a very good all-around camera. It's extremely small (about 2 ounces and 2.2 x 1.6 x 1.3-inches), has GPS, accepts voice commands, and produces excellent video. It's also got a cool semi-permanent (adhesive), magnetically-coupling mount that makes it easy to remove from the car. That may not mean much to suburbanites, but in a city full of opportunistic car thieves, it's a must. It's also quite handy when you want to adjust settings: Just pop it off, make the adjustments, pop it back. The Dash Cam 55 uses a magnetic coupling mount on your windshield. As far as smart features are concerned, the Dash Cam 55's move-it-stupid alarm is joined by lane departure, forward collision, as well as stoplight warnings and traffic camera alerts. All the interaction you could possibly want. And more. The Dash Cam 55's performance was very good. You can see the nice quality of the 3.7MP, 30-fps, 2560x1440 video in the shots below. You might prefer the 1080p HDR video, which better handles glare and night time shots. If we had any complaint at all, it's that the video seemed slight less stabilized than what we've seen from other cameras. Granted, my car has a stiff suspension, but I've used it with all the other cameras I've tested. We don't know whether the small size and light weight of the camera, or the magnetic mount, makes it more vulnerable to vibration, but the jitter, while subtle, was noticeable. Daytime captures were quite goodâin this case, despite the glare of the midday sun and a not-very-clean windshield. Nighttime captures were adequate, but we've seen better. About the "Go Alert:" It's great and it works, but it errs on the side of making sure you're truly asleep at the wheel, not sounding until there's perhaps 40 to 50 feet of clearance. A sensitivity control to tickle the habitually hesitant sooner might be nice. 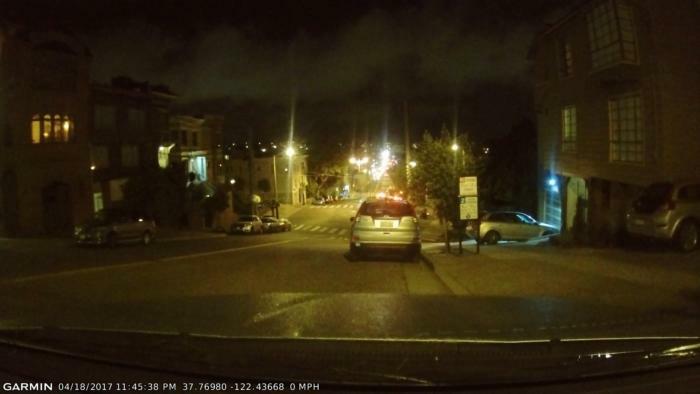 On the other side of the coin, the Dash Cam 55's red-light warnings were very thorough here in San Francisco. So much so, we grew weary of them in short order. 1080p HDR video from the DashCam 55 at twilight. The smudge near the top right read of the vehicle in front came courtesy of an avian friend. 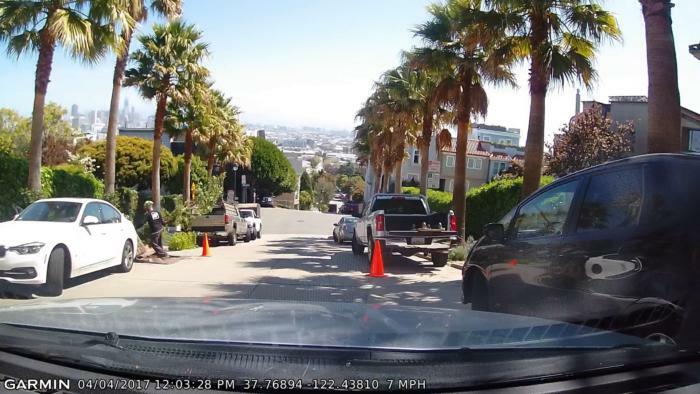 One other note: The Dash Cam 55 ran rather warm, and the upper edge of its climate rating is 100 degrees Fahrenheit. That's worrisome onlyÂ because we hear fairly often from users in hot climates such as Arizona or Florida, complaining about the rate at which the wee beasties expire. The unit is warrantied for a full year, so you can still give the Dash Cam 55 the shot it deserves. The Dash Cam 55 is controlled primarily via four buttons on its right side that serve as exit/up/down/enter controls. It can be also partially controlled by voice command using the "Okay Garmin" cue. Voice command worked quite reliably, even in my noisy convertible. There are six commands: Save Video, Take a Picture, Record Audio, Stop Audio, Start Travelapse (record video), and Stop Travelapse. All very helpful, but voice control is addictive and we wound up wishing for more. How's that for ingratitude? If there's a better single-channel (no rear camera) dash cam than the Garmin Dash Cam 55, you'd be hard-pressed to find it. Perhaps ThinkWare's more expensive models have an edge, but they're not this small and unobtrusive. The Dash Cam 55 is good stuff, though we wish it ran a bit cooler.